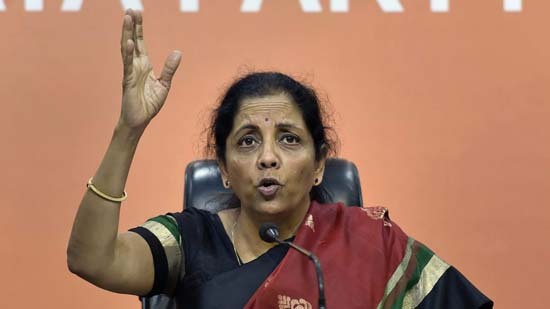 Defence Minister Nirmala Sitaramamn on Sunday said that Modi government is working round the clock to fulfill the needs of common people and fight against corruption and it is for the electorates to decide to vote for Narendra Modi to continue as Prime Minister for second term. Speaking at a roadshow in support of Bangaluru South BJP Candidate Tejaswi Surya here on Sunday, she said that the voters have agreed that Modi rule should continue and any alternative arrangement should be defeated. ‘’We are going to every house in Bengaluru to ensure that Modi will be our leader in the government for the next five five years. There is such good response from across the country that this will be the final decision, post the 2019 Lok Sabha election,’’ she added. Nirmala Sitaraman said the country needed a government that was accountable and free of corruption, this was the reason the people were responding whole heartedly for Modi to continue. She said she would campaign for other candidates besides the three in Bengaluru. “I will visit Shivamogga to campaign for B Y Raghevendra, son of BJP State President B S Yeddyurappa and later to support Anant Kumar Hegde in Karwar in Uttara Kannada.The Modi wave is on in the country and we will bring out the best results in Karnataka”, she said. Nirmala Sitaraman said that Karnataka had a remote controlled government and a state government cannot be dictated in its day-to-day activities from Delhi. ‘’If there is a storng Chief Minister than the present Karnataka Chief Minister, he needs no command from Delhi. Modi never agree for such a set up. Then under whose command is Karnataka being governed,’’ she asked. She alleged that earlier Prime Minister Manmohan Singh was governed under remote control. Should the Chief Minister be controlled from Delhi. Modi do not keep any remote control, she added.